The International Tchaikovsky Competition amounted to a breakthrough during the second half of the twentieth century in the official attitude of the Soviet state towards gifted youth, the art of performance, and the music of Tchaikovsky. The first competition in the spring of 1958 taught the country to hold out with pride the Russian-Soviet school of performance as "the best in the world," and to gain new idols by way of a system of regular international competitions. In the meantime, much water has passed under the bridge. 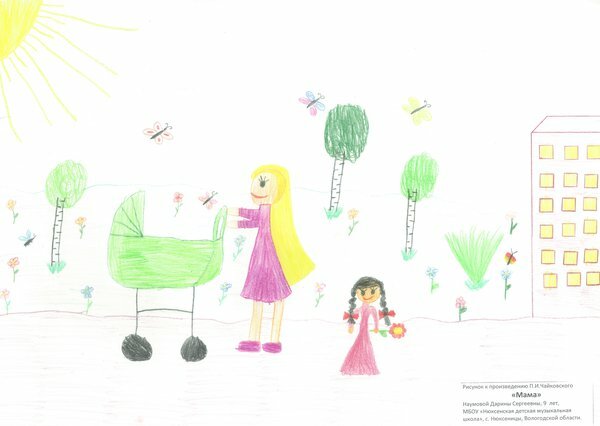 The iron curtain came down, teachers of the pre-revolution school were replaced by their pupils, the early prizewinners of the Tchaikovsky Competition, and then by their pupils' pupils. The world, which was once divided into "them" and "us" has once more become a unified whole. 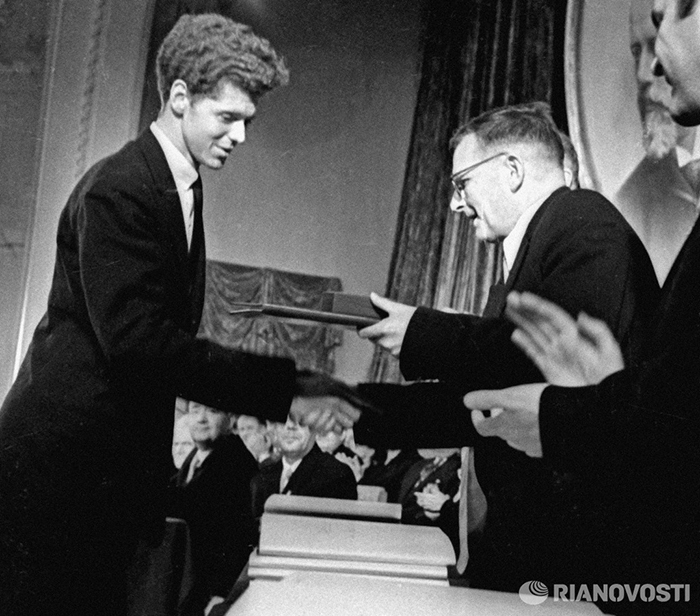 Van Cliburn receives the Gold Medal from the hands of Dmitri Shostakovich, jury member of the 1958 International Tchaikovsky Competition. In the fifty-third year of its existence, the Tchaikovsky Competition has assumed a dual character, with both Moscow and Saint Petersburg taking part in it. 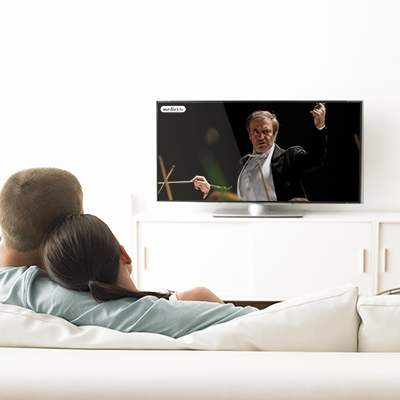 Increasing the competition's audience by way of the Internet, inviting internationally renowned performing artists to serve on the juries, and the participation of leading concert agencies in organizing post-competition tours all make one look with new eyes at what has become a sort of "national relic." With the plethora of competitions today, their results may no longer have the influence they once did in the current music market. Though we may tend to forget the victories of Grigory Sokolov, Gidon Kremer, or Mikhail Pletnev at the Tchaikovsky Competition, it is difficult to deny the importance of such victories both to their careers and the careers of many other past prizewinners. Under this year's dual-city experiment, Moscow retains the piano and cello contests. Moving violin and vocal categories to the city on the Neva may be seen as a symbolic return to the sources of the Russian school of performance, the traditions of which were laid by the founder of professional musical education in Russia, Anton Rubinstein, the teacher of Pyotr Ilyich Tchaikovsky. Just four years separated the birth of the Petersburg (1862) and Moscow (1866) conservatories. A graduate of the Saint Petersburg Conservatory, Pyotr Ilyich Tchaikovsky was destined to become one of the first professors of the Moscow Conservatory. On his recommendation, the Moscow professorial staff was augmented by Petersburgers, such as the composer Mikhail Ippolitov-Ivanov (a student of Nikolai Rimsky-Korsakov) and the pianist and conductor Vasily Safonov, a future rector of the Moscow Conservatory and, after his emigration to America, the Saint Petersburg-to-Moscow route was also taken by outstanding musicians of the twentieth century, including violinist and conductor Alexander Orlov, conductor Alexander Gauk, and pianists Heinrich Neuhaus and Maria Yudina. The joint efforts of the two cities formed the so-called "Russian school of performance." In 1958, it was united for the first time with its "foreign" counterpart. Van Cliburn studied at the Juilliard School under Rosina Lhevinne, herself a pupil of Vasily Safonov. The 1958 finalist, Daniel Pollack, was also her student. The violinist George Sidorov, a participant in the II Tchaikovsky Competition, started out in Los Angeles studying under one of the former Saint Petersburg students of Leopold Auer. There are many other such examples. The Russian-American violinist and teacher Efrem Zimbalist, in an interview with the newspaper Soviet Culture in March 1958, recalled the chamber music evenings at the home of Nikolai Rimsky-Korsakov, which he attended after lessons with Leopold Auer. In 1962, a pupil of Zimbalist, the Israeli violinist Shmuel Ashkenazi, received second prize at the Tchaikovsky Competition. Russian-born Gregor Piatigorsky was a member of the cello jury in 1962. At the competition, he met his brother Alexander Stogorsky, a Moscow cellist and teacher. Fates intertwined at the competition, giving genuine drama to the stories of dynasties and ordinary families. All of this enriched the Tchaikovsky Competition with a wealth of cultural memory. Numerous laureates have lived or worked abroad for many years, among them, Eliso Virsaladze, Liana Isakadze, and Paata Burchuladze in Germany; Gidon Kremer in France; Viktoria Mullova in Great Britain; Boris Berezovsky in Belgium; and Ivan Monigetti in Switzerland. Discussion of the "Russian school" in the sense of a geographical concentration gave way to the discussion of values or, as Boris Kuschnir, a member of the selection jury of the 2015 Competition, put it, "of the professional standard and honesty of the performer."